Asurion provides insurance for smartphones, tablets, consumer electronics, appliances, satellite receivers and jewelry. I’m familiar with them because I have had to make two claims in the past for lost or broken Verizon phones. The company has posted openings for BOTH English AND Spanish/English Bilingual Customer Care Reps.
Their starting pay is $11/hour and no state hiring limitations are listed. “Are you dedicated to providing exceptional customer service and driven to get results? 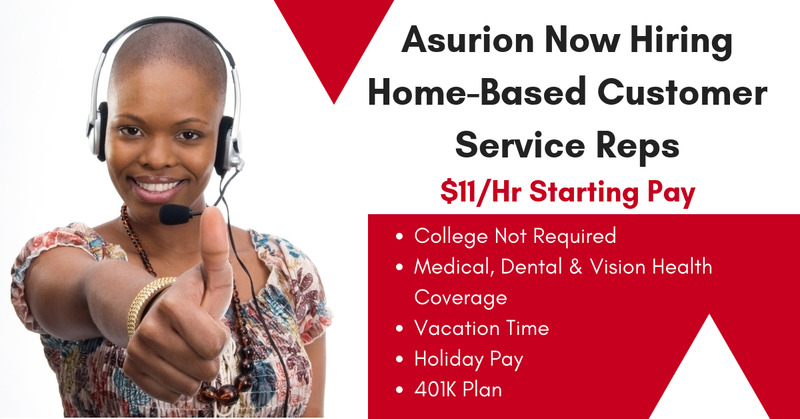 Join Asurion’s front line support team today as a Work at Home Customer Care Representative! As a Customer Care Rep, you will maintain exceptional customer service while providing remote support for customers’ inquiries about lost or damaged devices and resolve customer issues in a timely manner to get them back online in this fast-moving, tech-driven world! Our Work at Home starting pay is $11.00 per hour. For more than 20 years, we have lead the global tech solutions industry. We are leaders in creating innovative technology solutions that help keep consumers connected and we are committed to providing exceptional customer service to our partners – 300 million customers or 120 respected companies whose products you know and love. At Asurion, we value team success and create a rewarding and collaborative work environment where each employee can maximize their talents and contributions. We provide a fun and casual work environment and comprehensive benefits package that includes medical, dental & vision health coverage, vacation time, holiday pay, 401k plan. This entry was posted in Customer Service Jobs, Hiring Companies, Work at Home Jobs and tagged Asurion. Bookmark the permalink.